Originally published in the Northern Agrarian , September 2008. 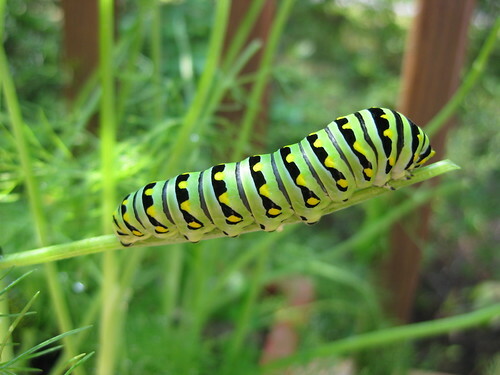 In June a black swallowtail butterfly laid a single egg in the windowbox of parsley on our front porch. Several days later an almost microscopic caterpillar emerged and did what caterpillars famously do. When it left its patch of parsley to become a chrysalis we couldn’t find it in the tangled mess that a seller’s agent would call shrubbery, and we hoped for the best. The miracle of a butterfly is a cliché, but it’s a miracle my daughter, who is four, hadn’t yet witnessed, and she gave me daily — if not hourly — updates on the caterpillar’s progress. And, really, it’s a miracle that never grows old. When the aptly named “Parsley” went off into the wide world we were all a little disappointed that we wouldn’t see her emerge as a butterfly. Then in early August another swallowtail appeared — and laid, this time, nine eggs that we could find. They had barely hatched when the butterfly was back to lay a dozen more. My daughter, of course, insists that the proud mama is Parsley herself, and she might well be, returning to her own safe nursery. Seven of the first — what do you call a bunch of caterpillars? A clutch? A litter? — survived, and this time we found all of their chrysalises, attached to forsythia branches, the underside of porch steps, and the vinyl siding. As I write this they are still hanging there, waiting. Early in the summer, while eating dinner outside, we watched a nuthatch bring her several fledglings to the feeder I’d hung from a sweetgum branch near the picnic table. My wife remarked that she had seen a nuthatch at a park and none of the women she was with had ever seen one before. I was baffled; we’ve always had nuthatches. I don’t think of them as rare or extraordinary. But nuthatches, like woodpeckers, nest in dead wood — in rotting trees, broken limbs, old woodpecker holes, or holes they’ve dug themselves in soft wood. And in the urban parks and suburban yards where most people see birds, there aren’t any dead trees. Once a suburban tree has ceased to be pretty, it’s removed like the day after Christmas, before it has a chance to fall on someone’s house. Even dead limbs are quickly pruned, lest they crash through a windshield. Decay isn’t ornamental, and in crowded conditions it’s a liability. So although nuthatches aren’t threatened with extinction, they need habitat that most people can’t see from their front porches. Which is a shame, because they’re pretty birds, and fun to watch, especially in late spring when they brought their young to our feeders. The juveniles, still fuzzy and awkward, buzzed in close to check us out while their mother fluttered impatiently from another tree: Get a move on! That part of the life cycle, like the butterfly’s emergence, is attractive to us humans. But it depends on another part of another life cycle — the slow death of a tree — that most of us would rather not have around. Nobody wants a tree to fall on their house, but the aversion to dead trees isn’t all practical. The great dead oak just beyond my back fence, which long ago lost its limbs and most of its bark, seems beautiful to me — towering against the sky, a relic of decades past refusing to fall, reverberating with the insistent sounds of woodpeckers — but I expect I’m in a minority. If a kindergartener assigned to draw a tree slashed this single line of brown on the paper, it’s hard to imagine the teacher’s reaction — a talk with the parents? Therapy? Your daughter draws dead trees. The correct Platonic tree has spreading branches, flush with leaves — unless in winter, but even then we focus on the twigs and buds awaiting warmth. Dead trees aren’t pretty, and they remind us of things we’d rather not think about. I notice, too, that while there are plenty of photo essays and children’s stories on the internet about the “life cycle of a butterfly,” they chronicle only the period from egg to winged emergence. We don’t see what happens to the adult butterfly after she leaves the dried-out chrysalis and flies away. Nor do we see what happens to the mother after she lays her eggs. If, indeed, it was “Parsley” come back to our porch, we know what’s going to happen to her. When she laid her last eggs, her wing was torn. Butterflies don’t live long, and she was near the end of her life. Soon enough, she’ll be dead — eaten, perhaps, by one of our juvenile nuthatches, all grown up now at the end of summer. Before summer ends, though, we’ll enjoy this last burst of new life — the happy, charismatic part of the life cycle, a reminder of spring before fall sets in. The butterflies should start to emerge in a few days, and it will be time to plant more parsley.